The Creation Windows: Let there be lights in the dome of the sky! Some of us come early and sit in silence, resting in the solace of sunlight through stained glass and the power of wordless music to order the heart. Some of us come with a burden of sorrow, regret, or apprehension. Some of us come radiant with gratitude. Some of us bring children full of energy, questions, and wonder. Some of us come with a living, burning vision of the reign of God. Some of us come to be known and greeted by name, to be ourselves, to be welcomed. We come for all kinds of reasons, not all of which can be put into words – but we are here every Sunday morning at St. Thomas to worship together. Worship is the living heart of this church and the center of this building. Our sanctuary is a broad, square room with a high, peaked wooden ceiling, and our worship layout puts us in a circle around the altar. Witnesses to one another’s presence, we all can see the Body of Christ as it is lived in this place and in our journeys across time. We see the young ones grow up and the old ones grow older; we see our shared work and sorrow and joy. During the academic year – that’s the last Sunday in August through the next-to-the-last Sunday in May – we worship every Sunday at 8:30 am and 11:00 am, with Education Hour from 9:45 to 10:45. In the summer, Sunday worship is at 8:30 am and 10:15 am. Nursery care is offered at all services. We have special worship services during Advent and at Christmas, and during Lent, Holy Week, and Easter. You’ll find service times for these on the HOME page. It’s been our joy over the years to bring visual grace to our place of worship. Read more about liturgical art at St Thomas here. 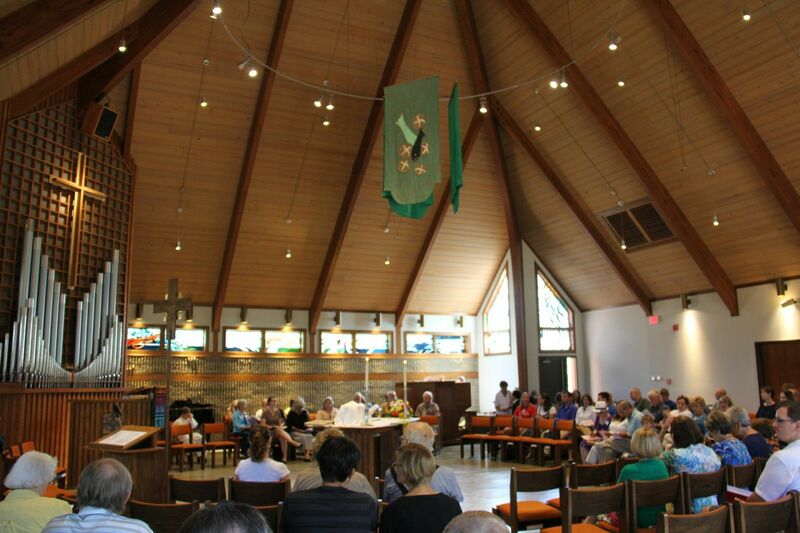 Worship at St. Thomas is part of an ancient, living tradition of shared liturgy. Read more about what it’s like to worship with us. Prayer is an important part of worship and of our common life. Read more about our prayer ministry. Through music, we invite everyone to discover our church and our traditions. Read more about the Worship and the Arts Concert Series.